Who are football's top January transfer targets? 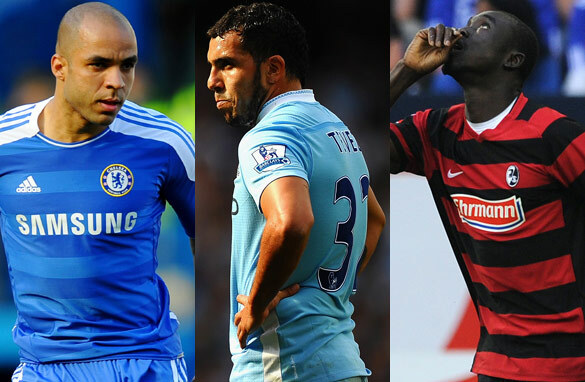 From left: Alex, Carlos Tevez and Papiss Cisse are among the top footballers who could be on the move this month. European football's January transfer window is now open, and clubs have started to intensify their scouting efforts in a bid to improve their chances of living up to expectations this season. Many managers don’t like spending a lot of money in the winter, but it could be the difference between success and failure. I have taken a look at 10 players who realistically could leave their current clubs and strengthen many others around the world. Of course there are some star players who are expected to move soon, like Neymar or Wesley Sneijder, but I have not included them in my list since they will most likely be transferred when this season is finished. So here is my list of the top targets this month. Some of them would be real bargains. Let me know what you think. Carlos Tevez (Manchester City): The Argentina forward is volatile and moody, and has played more golf than football over the last couple of months, but is still one of the top strikers on the planet and would be worth a risk. Tevez has been publicly courted by AC Milan, who want an initial loan deal. It is clear he won’t play under Roberto Mancini at Manchester City again, so the English club would do well to sell him for a fee of around $30 million. If they are holding out for $50-60 million, they won’t get it. Would be a perfect fit for: Paris Saint-Germain, Inter Milan, Arsenal. Alex (Chelsea): It seems like the Brazil international has been around forever, but he is still only 29 and would be a great acquisition for any team who needs experience in defense. It baffles me that he was transfer-listed by Chelsea, and there should be no shortage of suitors. I believe he could move for a fee of around $8 million. Even the mighty Bayern Munich could be interested in picking up another solid center-back for that price. Would be a perfect fit for: Arsenal, Milan, Bayern Munich. (Editor's note: Alex joined Paris Saint-Germain). Papiss Cisse (SC Freiburg): Explosive striker whose goalscoring record over the last season and a half has been tremendous. He has scored 33 goals in his last 49 matches for Freiburg, a team that is average at best. The 22 Bundesliga goals he scored last season were the most ever by an African player in Germany’s top flight. You may think he would not be a good investment considering he will be gone for nearly a whole month at the African Cup of Nations with Senegal, but I believe he would still be an asset for any team needing athleticism and fire power up front. Watch out for the 26-year-old, he will make a major impact at a major club very soon. Roman Pavlyuchenko (Tottenham): Frustrated by a lack of first-team opportunities at Spurs, the Russia striker is itching to move. His goalscoring record in the English Premier League is pretty good considering he hasn’t played many full games. He is mobile, skilful, holds the ball well and is a great finisher inside the box. I believe he could be a real bargain with a bid of around $19 million sufficient to tempt Tottenham to sell him. Would be a perfect fit for: Ajax, Borussia Dortmund, Napoli. Leandro Damiao (Internacional): Even though he has failed to impress me when playing for Brazil's national team, I can’t ignore his goalscoring record for Internacional. Damiao netted 40 times in all competitions in 2011 and has the speed and skill to become a quality striker. He would be a great signing for an up-and-coming team who can give him time to mature and get used to the faster pace of European football. Would be a perfect fit for: Marseille, PSV Eindhoven, Malaga. Milos Krasic (Juventus): The speedy Serbia winger has not fitted into Antonio Conte’s tactical plan at Juventus and will leave Turin sooner or later. The 27-year-old was great for most of last season in Italy and would be a valuable addition to any team needing an element of pace and unpredictability in their attacking play. Would be a perfect fit for: Chelsea, FC Porto, Inter Milan. Andrei Arshavin (Arsenal): This man is an enigma. The Russia captain has shown flashes of brilliance since moving to London in 2008, scoring four goals in one match at Anfield against Liverpool, but more often than not he flatters to deceive. This season the 30-year-old has been especially poor, scoring only twice in 21 appearances and often looking disinterested when he’s been on the pitch. I believe Arsene Wenger has failed to use him in his best position, just behind the striker. Since that won’t change, he could leave this month. Would be a perfect fit for: Valencia, Benfica, Fiorentina. Fredy Guarin (FC Porto): The Colombia international has excelled at Porto since signing in mid-2008 and has declared his desire to move. He is not motivated in Portugal at the moment and is pining for a transfer to one of the world’s top teams. Guarin is a multi-talented midfielder who can tackle, pass and score - a box-to-box player who would add strength in the center of the park. I have always liked to watch him play and believe he is ready to make the jump to a better league. Would be a perfect fit for: Arsenal, Manchester United, Inter Milan. (Editor's note: Guarin joined Inter on deadline day). Victor Caceres (Libertad): Not many people know much about the Paraguay international, but he has been a key player for his club and country for the last three years. He has won a total of five national titles and is ready for a move to Europe. A hardworking defensive central midfielder, the 26-year-old Caceres would fit in well in Italy or Spain. The English Premier League might be a little too fast for him right now. Would be a perfect fit for: Paris Saint-Germain, Valencia, Bayern Munich. Mounir El Hamdaoui (Ajax): A lot of people have forgotten about the Moroccan striker since he has been ostracized at Ajax after clashing with manager Frank de Boer. The 27-year-old may not have played at all this season, but he would still be a good addition to any side looking for a solid finisher. He scored heaps of goals for AZ Alkmaar (43 in 57 Dutch league games) and would come in handy for the second part of the season. He will be fresh and willing to prove his worth. Kaka on the move too. Guarin would slide right into United's midfield, and given Sir Alex's Portugese track record, and frailties in midfield, I don't see why he wouldn't go after him. At 25, he seems to be the perfect buy for United this transfer window. LOLOLOL Arshavin to Benfica? Who would be paying that hefty Salary? Arshavin is not suited to any Portuguese teams pocket book. Plus...who goes from one of Englands top teams to Benfica? hey Pedro i believe that tevez would be better at tottenham cause he has pace and he likes to fight when his is on the pitch .I'd be exciting to watch him play with bale and lenon on the sides. very good article pedro, i think papiss cisse would be great for liverpool, as they need a goal scorer and milos krasic would be a good signing for liverpool, as i think downing is not that good. I think el hamdaoui would do well at newcastle and seville. Finally i think tiote who plays for newcastle should be on the list, i personally think he is one of the best defensive midfielders in the world and could play for a club like real madrid or ac milan. I'm surprised that there wasn't any mention of Mario Götze and his teammate Kevin Grosskreutz. The Bundesliga this year is showing quite a bit of surprise and Dortmund are at the top of their game now. The INTERNACIONAL team is the better of world. Pedro, Do you remmember that Intarnacional won Barcelona?? The USA guys need go to Brazil to learn football, especially mr. Pedro. And what about Luka Modrić from Tottenham??? what I am most interested in is about Andrei Arshavin, for I like the player in Winning Eleven, the TV game. He acts very nice. Olá Pedro. And what to say about Porto player Hulk? In the last days it was said that Chelsea was willing to pay €100M ($129M) for this player. but i think arshavin should not boarder him self,because he has to put more force in his training sessions .he is a good player but i donot know why. Well Ashavin is getting old and his time at Arsenal is gone. We need young and good players. Reports say World Cup footballer Densill Theobald of Trinidad and Tobago is to make his debut for Dempo Sports Club from January 2012. The former Caledonia and Falkirk footballer is expected to further fortify the midfield of the four time Indian champion club from the West Coast. We are in the midst of our annual I-League competition and at the conclusion of the first phase, Goa's Dempo Sports Club finds itself at the top of the pack with 27 points from 13 games. The race for top spot is getting hotter each passing day. Our teams and fans have witnessed some upsets too. With Densill Theobald in the playing eleven, Nigerians Ranti Martins Soleye, Koko Sakibo and Dempo squad mates are expected to stake their claim for top honors in the I-League. Hey Pedro, I think sir Alex needs to reconsider and buy an established player and not one of those player 'with prospects'. Wes Sneijder weaved coming to ManUtd in August and then it seemed like we might get on fine without someone of his calibre but so far the midfield has been caught lacking. The attack is without poison and the title is seemingly becoming hard to secure. Only by shaking that money purse can we get back on track and become that formidable force in european and world football. What about cristiano ronaldo and lional messi??? How about Mehdi Benatia ? Udinese will sell him for sure. The question is who will be get him ? R. Madrid, Chelsea, or M. United ? I think Lukas Podolski will be on the move as well. One of the best in the world IMHO. Pavlyuchenko linked to Ajax is probably the most nonsensic rubbish I have ever heard. Ajax can't afford anything close to the transfer amount that is needed for such a striker, the salary he's making is about 5 times as much as the highest salary at Ajax and Ajax will not, in these times, sign a 30 yr old player. Tevez to Arsenal! And play along side Superscorer Robin van Persie? Right! Cisse to Chelsea, you've got to be kidding. Arshavin in Portugal, this cannot be serious. And if your headline talks about 'top targets' than write about top targets! And by the way... I am not Spanish.... but can recognize greatness when I see it... and it is not in Real Madrid, arguably No. 2 WW but still a team that despite all the hype looses 1-3 at home to Barcelona playing half as good as what they can... this was just a few weeks back. As another comment posted correctly, you missed Hulk (a great player and courted by other teams). He made Porto look good when they lost to Barcelona end of Summer, he is a great and powerful player. Thanks for this insight. Off course there are different reasons for it, but it's still remarkable to see these players not performing or playing at their club. Again many thanks, and keep up the nice articles! Tevez! come back to United!!!! I disagree completely about the Alex transfer, it looks as if he will be making the switch to QPR or he will return to Brazil. Ashavin for Benfica? Not better than any of the other top international players we have, no tks. Are you trying to sell Guarin for Porto? Avarege player not worth 5 Miilion, should not even be on the list. I tot higuain might be on his way to liverpool. man utd are broke the only way they could sign anyone is if they sell rooney!